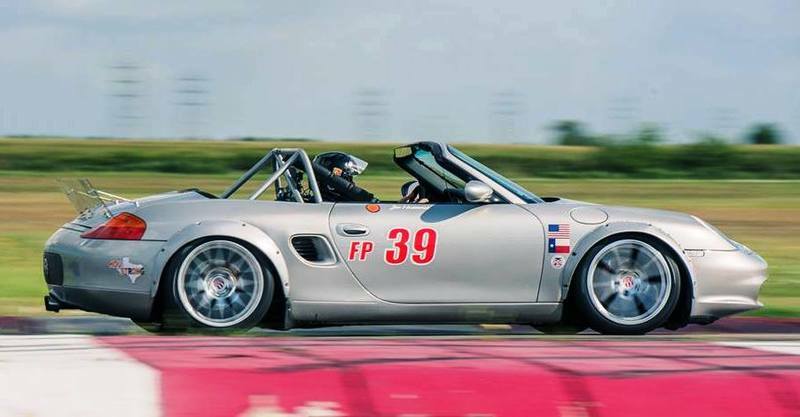 Missed a shift breaking my 3.2 engine which is not salvageable on my 2001 Boxster S race car. Found a suitable 2002 996 3.6L and there is a lot of info out there on the mechanical steps and wiring harness mods necessary to swap the two engines. On the ECU there seems to be general agreement that the donor car Motronic 7.8, immobilizer, and key should be swapped into my car and I have secured these items. After tracing out the wire loom modifications necessary to convert to 7.8, it seems a bit daunting. It appears the tutorials and information has been taken down from the renntech board. I got my original question answered privately (don't try to use the 2001 Motronic 7.2). Others have also shared some nightmare stories about trying third party racing ECU's on Porsche engines though a few have them working. I am now am on the path of comparing wiring diagrams between the 2002 and 2001 and creating a spreadsheet from scratch to document the necessary wiring changes. Others have created these but they also seem to have all been taken down from the forums. I am close but the diagrams I have have aren't yet telling me the whole story. I have a full Motec M800 system with my 2005 3.6 engine in my Boxster. I recently had it retuned for 91 octane (car was originally back east and tuned on 93+). The goal was not to get the most HP but to get a good solid tune that would hold up on the track. The new tuner found a lot of deficiencies in the original tune - although the fact remains it was done 10 years ago and a lot has been learned since. Can't believe how much better the car is running right now. 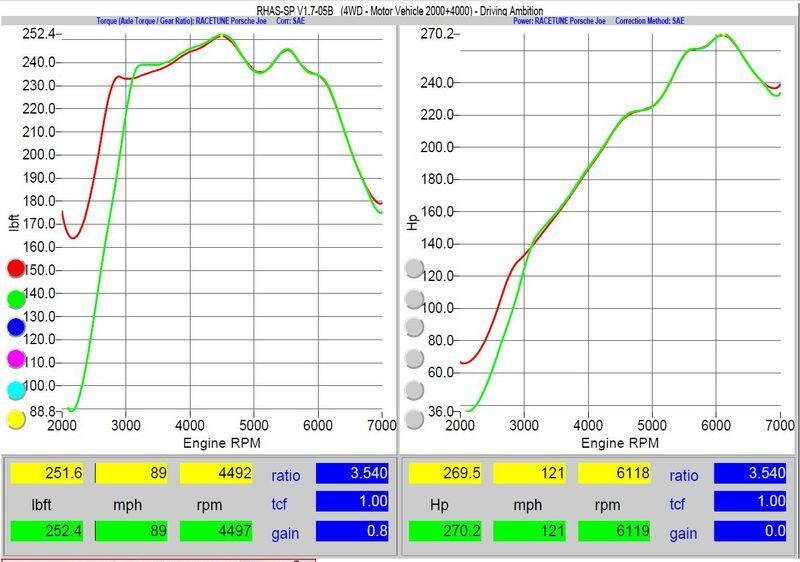 We recently finished the tuning on a dyno. The engine is completely stock - except for the headers and relocated airbox. Here's the dyno. We'll be heading to the track to finish the fine tuning soon. He only charged me $1300 for everything which included him coming to my house to do a diagnosis (was having a hot start problem), then again for pre-dyno tuning the day before the dyno and then the day at the dyno. Cost for dyno rental was $400. He won't be charging me for the track side tuning. so, your car has variocam, which is on/off cam timing adjustment. your engine has variocam plus, which is variable cam timing and duration adjustment. the latter requires more ecu brain power to operate, and physically more wires. 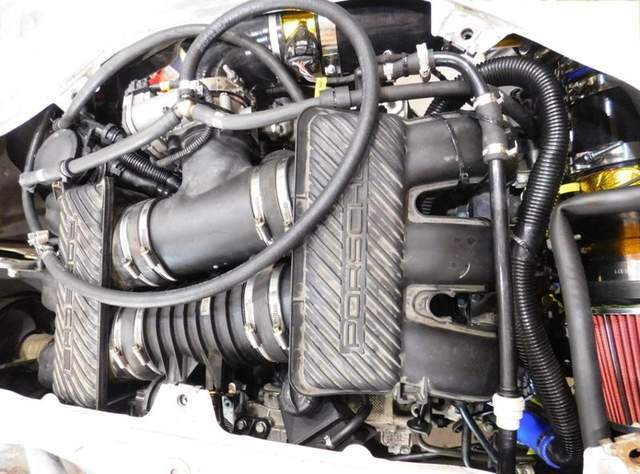 for this reason porsche moved from the 7.2 dme which is in your car, to the 7.8 dme which is what the engine needs. 2) run your engine with w 7.2 dme. the former is the more seamless of the two, but there is a complication; the 7.8 dme also introduced CANBus communication, which is a multiplexed signal over a single twisted pair of wires, vs the previous 'wire per signal' approach. this means that the conversion also requires changing a number of other controllers in your car - gauge cluster, abs pump (which requires changing wheel speed sensors) hvac controller (probably not an issue for you). and, of course, a number of pinouts have to change, and the other things that come with the conversion (non-return fuel lines, etc. ; as per pelican). the latter is possible and referred to in todd's renntech thread. there was a (nla) module you could get that took an rpm signal and converted it into variocam plus inputs (requires logic and maps of cam timing and duration vs rpm and, presumably, engine load, iat, engine temp, etc. - most could be gleaned from porsche info on variocam plus, and probably squeezed into an anduino-type thing). OR you could run your variocam plus like a standard variocam and just have it turn on/off; cam change-over will hammer things, but all you need is an rpm-driven (or, presumably, variocam signal-driven) window switch. heck, i've even read of racers welding the cam into the high rpm position and being done with it. Very nice! Thank you for the information. Thank you for the information! I am heading down the 7.8 DME path as the 2001 Boxsters have a CAN buss for most things except ABS/PSM. Also the DME, immobilizer, and key are available from the donor car. I would say I have 90% of the wiring changes figured out but as we know it is the last few that can be troublesome. I will post a spreadsheet once I have everything running. good; hopefully you can keep the gauge cluster. i didn't have any luck trying to code a 2001 986 with a 2001 996 tune, so there may be other issues that require updating the gauge cluster (you'll need a 2002+ 996 tune or dme from such a car to run the engine properly - sounds like you have the latter). with the abs pump, check your part #'s as there are many versions out there (psm vs non-psm, year, etc.). i think you only have to change rear wheel speed sensors, but spending some time with the PET to see what year parts changed is you friend there. i think there are forum members from texas that have a pst2 to help you with your coding if needed, but can't recall who (nova?). Great looking car! Have any more pictures? How’d the flare install go? I'll have to figure out how to upload a couple more pictures. The flares are inexpensive universal ones that had dimensions that looked like they would work. I bought them on EBay from a seller in the Ukraine for $130 or so. The car is lowered almost 2" with MCS two way coilover shocks. I have 10.5" wide front wheels and 11" rears so I needed 2.75" front flares and 3.75" rears. The real leap of faith was after measuring for a couple of days was to take the reciprocal saw to the fenders to cut them for clearance. 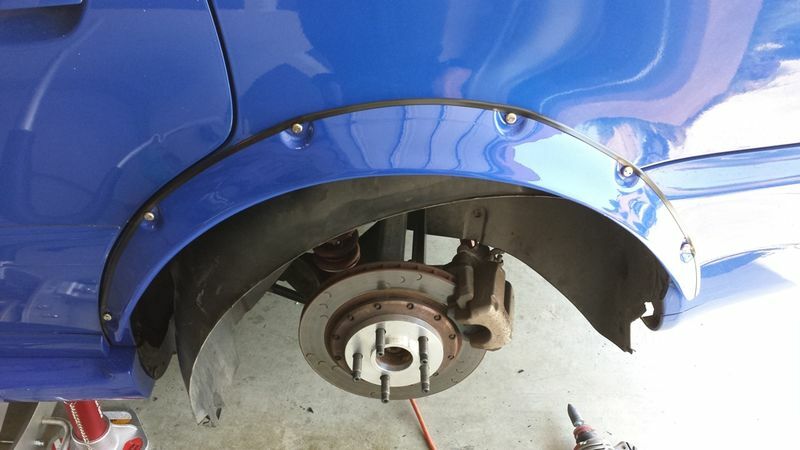 The rear fenders have a metal inner fender so you have to deal with the gap after you cut a new arch. I sealed it with spray foam and then silicone so it doesn't get filled up with gravel. Fairly crude but it works. Then it was a matter of painting the flares and attaching them with small stainless steel screws. In the front I added some screws between the built in pockets to make them better fit the contour of the factory fenders. Do it nice or do it twice. 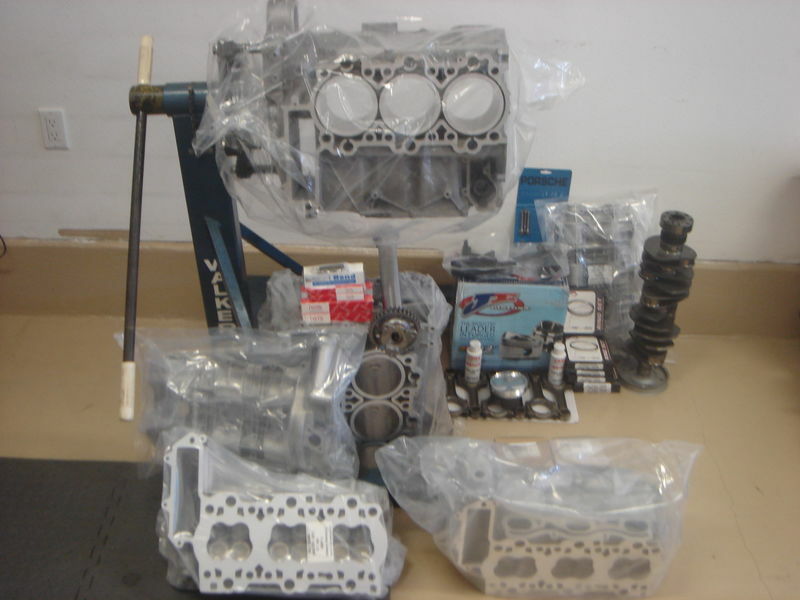 I have a complete 2001 Boxster long block that i have rebuilt with the LN 3.6 liter sleeves for sale for $14,000 plug & play with no mods required. Very nice but roughly twice what the 996 motor I am being offered costs. It has the LN bearing and a few other upgrades. Not having to change the ECU is a great selling point. Attached is a PDF of a spreadsheet that I created to help me understand exactly what wiring changes need to be made to a 2001 Boxster with partial CAN buss work with the later DME 7.8 that controls the 3.6L 2003 996 variocam plus that I would like to install. A green row is a wire that is good to go. No changes needed. I non-highlighted row is pin that I am not sure where it goes whether it is needed. I have six unknowns. My 2001 Boxster service manual is apparently and early version where not every wire is labeled in English. Peleican Parts has a picture from a 2002 Carrera manual of sheet 12A of the wiring diagrams. This was immensely helpful in filling in most of the questions I had on plugs A, B, D, and E.
However I need sheet 12 wiring diagram from a 2003ish Carrera to be able to better understand the the pins in plugs C and D that I am not sure where they go. Any help I can get would be greatly appreciated. I will continue to post updates as I learn things and once I get the car running, I will post a "know good" wiring conversion spreadsheet. I used similar flares when going wide body on my old B5 S4. No way was I paying for all new quarters to be put on the car. Same issue with the rears. 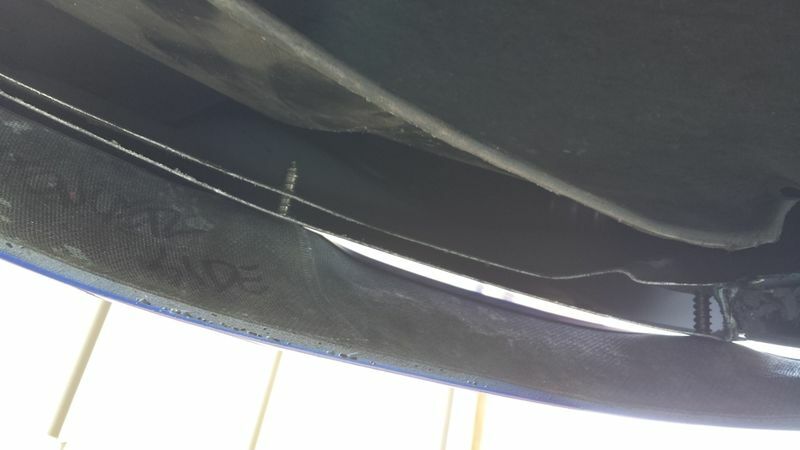 I used screws which went through both sections - put in some seam sealer and then screwed them "shut". Scariest part was taking the saw (I used a jig saw) to the panel. Nothing like 275's all around a 430whp awd car with LSD's for max grip. ARP rod bolts,LN Nickies billet sleeves, JE pistons ? Not having to change anything to be exact! You did a better job than I did. I bought a second set that is even wider that I plan to put on at some point. Maybe I can do a better job this time with the experience gained on the first set. Thanks - it was a major PITA. Too bad that car never ran right. Well actually it was a good thing it never ran right because it's what led to me getting the Boxster. Good luck with the modifications! Well the 3.6L conversion is done, well as much as any race car is ever done. 1. I upgraded to a non-return fuel pump so I could use the 996 fuel rails. 2. I acquired a donor 996 air box and used a cut off wheel to cut out the 3.5" MAF sensor mounting tube. I then fabricated a 3.5" intake system. Works perfectly with stock 7.8 DME from 2002 996 manual. 3. I bought a DME 7.8, immobilizer,and key off EBay. I will publish my spreadsheet of the wiring changes. One question for the Forum - Speedometer doesn't seem to be working though PSM and ABS do work. I may have missed a wire. Any ideas? Update: Driving the car up and down the road reset something and the speedometer now works fine. At 2500lb and 320 hp, car now is a beast. 0-60 in the mid 4 second range. Should be fun. Congrats! Welcome to the club. The torque is what is so amazing - and also what can be handful coming out of lower speed corners in 2nd gear. So much fun though.